Hello all, and welcome back to my loverly blog! I hope that your January and beginning of February have thus far been fab and Idol-filled! And if they haven't (because certain Graduation Announcements were made, WAAAH! ), then hey, let's hope March is a little better, aye? We can all dream, ahaha... waaaah! ANYWHOO, given that it's been well over a Month since my 5th Anniversary Contest officially ended, I do believe it's high time to formally announce the winner and, basically, to settle your minds on whether or not I forgot about this contest. I didn't, seriously. It's just that a lot has been on my mind lately, from anxiety to work, to University and other things. Life is a hectic process, after all! I also want to clarify that, with this contest and any other I may hold in the near future (I like holding them XD), I do ask for outside help with my judging process. This is to assure that I have more than one opinion on a piece, as well as to choose a suitable winner. Indeed, this is my blog, but asking for other peoples thoughts and views on potential winners helps me to feel a lot more confident in the decision process. It's how I work, and it also results in a fairer judging process. Furthermore, please understand that, whilst I would love to give everyone something for participating, I can't; I am one person who is also a student. A lot of my funds go on rent, food and basic living. So, for this contest, only one Winner has been chosen. I apologise. Again though, I hope to hold another contest, so be sure to watch out for that when it eventually happens! 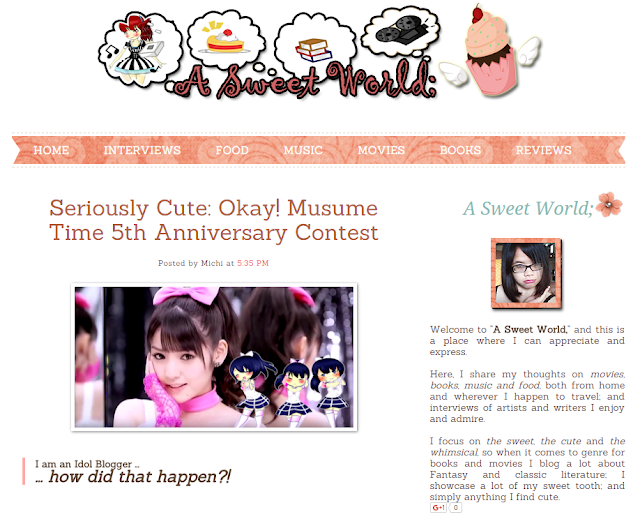 This Contests winner is Michi, author of the blog A Sweet World, of which you can find HERE. The blog itself is, surprisingly, not entirely Idol based, but also includes reviews on food, books, music, and all the things that Michi herself loves. And of course, for the contest, she wrote about the Idols she loves, how she got into them, and the Idol who basically started it all. It's a decent post in length and a genuinely good read, so if you have the time, please do check it out! Honestly, with everything you guys sent me for this contest, there was something in there that I connected with and related to. I enjoyed all of your entries, whether they were written, drawn or embodied in a video. They all spoke to me, they made me think, and some even made me tear up. Above all though, each one made me smile, because you all showed me why you love Idols, and what they have given each of you. It made me incredibly happy to see how you put all of your hearts into this, hence why it took so long to find a winner. What I loved about Michi's piece though was that, even though it was about Idols and why she loved them, it was also about everything else she loved, too. She didn't just write about the Idol aspect; she connected every other hobby and joy of hers to create a piece that is coherent and relatable, but not just to an Idol fan. She enables you to understand why she became a fan and what it means to her, and the inspiration Idols have given her. It is an honest post, an I enjoyed every moment of it. The outside helpers I requested to aid me in choosing a winner enjoyed the post, too; they liked how it was displayed and written, and what Idols meant to the writer. So, because of their positivity towards Michi's post, it was decided that she would be the winner for my 5th Anniversary Contest. To everyone who entered, I truly thank all of you for your splendid entries. They were all amazing, and please, don't feel let down because you didn't win! This was a process that took more than my own opinion to come to an agreement and a final winner, and whilst I do wish I had the money to give you all something, I know I cannot. Please be assured though that you all gave me something wonderful, and that I enjoyed each and every entry. You are amazing, inspirational people, and I am so happy that you chose to enter this contest and share with me your stories and reasons as to why you are an Idol fan. And, hopefully, you will all join me again in a future contest. For now, please enjoy your Idols and revel in the happiness they bring you. And, until next time, please stay happy, healthy, and of course, love what you love!